Now (the present, if I didn’t make myself clear) is a great time to be a Stryper fan. They really have come out of the blocks at speed, and come out fighting, if that’s a Christian thing to do. Maybe not, but it’s a good example of their progression since the original foursome got back together. Where some bands are treading water, Michael Sweet et al are pushing their boundaries further than most. Sure, albums like ‘In God We Trust’, ‘Soldiers Under Command’ and ‘Yellow and Black Attack’ have classic Stryper moments, the sound production wasn’t always at its best. Jump forward 25 years and both ‘No More Hell To Pay, and now ‘Fallen’ have production levels that befit their sound and quality. All of that is down to their leader, Michael Sweet. I’m a big fan of Stryper, ever since I heard ‘Winter Wonderland’ to be honest, and it grew from there. Back in the 80s, wearing a Stryper tee-shirt was the equivalent of a Hells Angel turning up in a Hello Kitty jump suit. It was something that you hid from your mates. Well, not any more! I’ve always stood up for these guys, no more so than now. Yes, the religious references are there for all to hear, but (and this is a huge but), this album takes Stryper up to new levels of greatness in my eyes. Sugar sweetness has (mostly) been vacated for the heaviest sound that Stryper have ever achieved. 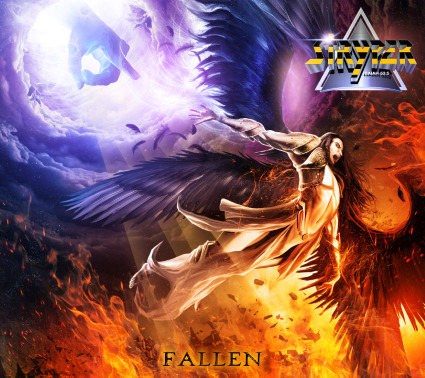 Ok, so its not Pantera/Motorhead levels, but Stryper are massive fans themselves of Heavy Metal, and ‘Fallen’ is a cracking example of modern metal. ‘Yahweh’ is the national God of the ancient kingdoms of Israel and Judah, and is also a divine warrior who leads the heavenly army against Israel’s enemies (for those of us who are not religious). In this instance its in reference to Jesus’ crucifixion. References aside, the song itself is a great opener. Stryper’s harmonies are completely off the ‘StJoSt’ harmony scale! (StJoSt is the industry measurement scale based on the harmonies of Styx, Journey and Stryper) Michael only hits these heady high notes on albums nowadays, but at least he can still do it in small doses. Couple this with the twin thrash guitar attack of Fox and Sweet and it is a match made in Heaven. Parts of ‘Yahweh’ are akin to the ‘Powerslave’ era Iron Maiden. ‘All Over Again’ is Stryper’s only calm moment. It’s a ballad, but not in the Stryper sense. Its more country than the ‘hair-ballad-wedding-dance’ songs they used to do. I can see this being a firm favourite with the 777 faithful out on the road. ‘After Forever’ is a very good cover of Black Sabbath’s Christian song, and was one they probably thought about for ‘The Covering’. Stryper are not afraid to show their influences, and ‘After Forever’ is definitely not a filler. Neither is it controversial. Good music, is good music after all. Fallen ends strongly with ‘Let There Be Light’ and ‘The Calling’ in particular grabbing the attention with their powerful riffs. A true testament (yes it is blatant) is that some of these songs need to be added to the faithful set list. In doing this, their live shows will be even better than before. This is the most energetic that Stryper have ever been. Mushy ballads have all but disappeared and in their place comes power, strength and positivity. That is a great recipe for success. Long may they continue!